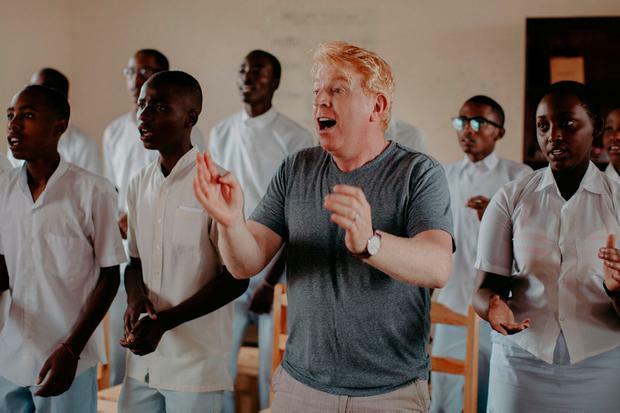 The video for Tommy Fleming's uplifting version of Supertramp's 1977 hit, Give A Little Bit, which he recorded with teenagers in Rwanda, has landed. The very special Christmas charity single will raise vital funds for Irish charity Bóthar and their work with widows of the Rwandan genocide, which saw up to one million people slaughtered over the course of 90 days from April 7, 1994. The Sligo singer teamed up with students from the east Rwanda school, Rwamagana High School, located an hour from the capital, Kigali, to record the single during the summer. He spent three days with the group and described them as "phenomenal". "We've brought them from 16 kids who were afraid to say 'hello' to now 16 kids who are about to perform on the stage," he said. "Working with these amazing young people was probably one of the biggest highlights of my career to date. It was wonderful it was - you know what it was just bloody great. I loved it." He added, "The end game for this is this is going to be released on a single to support the work that Bóthar do here in Rwanda and many other countries. It's so imperative that you support this fantastic cause. The song is all about giving a bit love, giving a bit of peace, giving a bit of everything but mainly giving a bit of hope." Tommy took time out from recording his new album, Voice of Hope II, to travel to the African nation where he met with families who are living with the legacy of genocide. He also visited the Kigali Genocide Memorial, which is built on the site of a mass gave of 250,000 people. "Yes, there's been a lot of sad times," he said. "I've been humbled. I've been saddened. I have been surprised but you know what? I, more than anything at the end of this trip, I've been delighted. This was good. I enjoyed this. It gives hope." Tommy also witnessed the positive impact Bóthar's work is having on the lives of the people of Rwanda. Funds raised from the single will go towards supporting the government's 'One Cow Per Family' programme, which aims to reduce extreme rural poverty by providing every family with a cow.